1956 was a good year for film, yielding classics like Stanley Kubrick’s first feature The Killing, one of John Ford’s most enduring and haunting films (and another Star Wars influence), The Searchers and Cecil B. DeMille’s The Ten Commandments and of course Forbidden Planet. A revelation when it was released in 1956, presented in CinemaScope, glorious Eastman Color and a — in properly equipped theaters — stereophonic soundtrack, topped off by better special effects than had ever graced the silver screen and finally a story that was absolutely ridiculous, yet resonating, powerful and grand. Forbidden Planet was in many respects the Star Wars of the mid–50’s; a rollicking and fantastically well-produced science fiction adventure for all ages. In all but box office receipts that is. Its grandiosity hadn’t come cheap, in part because of the numerous special effects innovations required to make it come to life in the first place. Robby the Robot alone had cost the studio $100.000 (in the neighborhood of $845.000, adjusted for inflation). This made it difficult enough to recoup the cost, but it suffered additionally under its misconstrued ad campaign. Hard to imagine today, given how retro-iconic the poster itself has since become. But it made the misstep of selling the film much in the same way as most other exploitation movies of the time, when in fact it was something much more cerebral. While originally released on March 15th, 1956, Lucas saw Forbidden Planet on his twelfth birthday, May 14th (Star Wars too would be released in May, and essentially to the same age group as Forbidden Planet, some twenty-one years later). At just the right age for the spectacle of it all, and already thoroughly seeped in comic books and serials the likes of Flash Gordon and Buck Rogers, Lucas could hardly have been better primed for what was arguably the greatest science fiction adventure to ever hit the screen. The poster wasn’t lying, it truly was Amazing! In the wake of the scientific and technological leaps made during and after WWII, at the dawn of the nuclear age, the 1950’s saw a resurgence of science fiction – pushed in part by the great war, and pull in part by the burgeoning cold war, it most often veered into the paranoia-driven ‘invaders from space’ sub-genre, with only a few noteworthy entries (e.g. It Came From Outer Space (watch online), The Day the Earth Stood Still and War of the Worlds). Many of them were cookie-cutter money-grabs, featuring pretty, perky and often scantily clad, helpless girls, merciless aliens, giant insects, killer robots, and strong every-man heroes. None of which Forbidden Planet was above of course, having both a mini-skirted Anne Francis, a most proper, dashing, if wooden Leslie Nielsen, and a mad scientist. However, it is saved from sharing the fate of its contemporaries through pure technical virtuosity, in design, special effects and music, and a hint of classical themes intertwined with the then still fascinating new world of psychology. A kind of Freud by way of Shakespeare (in spaaaace!) Forbidden Planet managed to raise itself above the crowd, and actually be both classy and despite its heavy stylistic tendencies, classical. Famously itself an adaptation of Shakespeare’s The Tempest, and essentially the mold from which Star Trek was cast, Star Wars and Forbidden Planet may look nothing like each other, yet the influences come fast and furious from the very first frame. It plays, as trailers often did back then, as an actual presentation of the film, with the narrator introducing the characters and the peril (with certain shots mysteriously reversed from how they appear in the film itself), and it shows quite well how MGM was trying to sell the film. Firstly, the scroll-up claims that ‘MGM’s great technical staff brings you a magnificent picture of that distant tomorrow’. Not the director, but the technical staff. Anne Francis, supposedly naked and very naive, front and center. ‘Oh, murder!’ indeed. Then there’s the spectacle of Robby the Robot (again with a naive Anne Francis), and finally all of the greatest shots of the film–shots that remain amazing to this day, a which rival those of Star Wars–right there, in the trailer, full-length. It’s fun to look back at a time when marketing campaigns were less controlled than today. Here the title of Forbidden Planet, presented with a furious, Superman-the-Cartoon-esque ball of fire, is quite different from the one presented in the film itself. The same was the case for Star Wars of course, the trailers for which (here and here) are horrendous and hardly representative of the film, using an unfinished logo, and claiming that it might all be happening right now, despite the film itself claiming from the very first frame that it is set a long time ago (they finally fixed it by 1982). In the interim between the young Lucas seeing Forbidden Planet and the adult Lucas making Star Wars, Kubrick’s 2001: A Space Odyssey had effectively redefined the look of science fiction movies for good, with its kitbashed models and accurate portrayal of space travel. And so, while they might share names and functionality, technology like the ‘common blasters’ of Forbidden Planet, which became simply ‘blasters’ in Star Wars (so common there’s no reason to make a note of it), were similar only in name, and less so in aesthetic. In a sense however, Star Wars was simply the modern expression of those self same ideas. Likewise, the hologram Morbius generated of his daughter, Altaira, through the Krell IQ machinery, became Leia’s plea for help. An effect achieved in the same way, by locking down a camera and shooting the actress on a background of black. Then compositing the footage onto a similarly locked off background plate, though with a modification. Instead of simply compositing the two images together, Lucas chose to film the original recorded message off of a CRT screen, to give it a flickering, interlaced look, a technique he had first used in THX 1138 for the futuristic hologram television. Speaking of the Krell, it’s very possible that the screenwriters had first borrowed that word from Isaac Asimov’s Foundation novel, first published five years prior. In it the planet Korell makes an appearance, inhabited by Korellians; a part of the Korellian Republic. “I’ve outrun imperial starships. Not local bulk cruisers, I’m talking about the big Corellian ships”, as Han says, defending his ship. And indeed, his own ship is, according to Lucas’s early notes, “of Corellian design, from Crell, and is used primarily by Corellian spice shippers.”[p351, 2]makingofstarwars, though whether he picked up the word from Asimov’s book or Forbidden Planet is hard to say. Regardless, the Krell undoubtedly inspired something else entirely. Their greatest invention, ‘a single machine, a cube 20 miles on each side’, ’powered by ‘9200 thermonuclear reactors’, with ‘8000 miles of klystron relays’, became the Deathstar. Both vast, artificial machines, they hold terrible destructive powers, and were built with little concern for personal safety (it’s a handrail between you and a 3 mile drop). And in the end, both destroy a planet (Altair IV and Alderaan respectively). The Deathstar interior is less flashy than the Krell machine, but remarkably similar nonetheless, with the same kind of angular structures, walkways perched above seemingly infinite depths and an altogether mechanical structure of an unfathomable size. It’s impossible to say if the idea for a mechanical planet originated with Forbidden Planet. But there’s no doubt it had a profound influence on what the inside of such a place would look like. And if you pay attention while Morbius is showing the two officers around this wondrous place, you might even find the droning beeps in the background of the Krell machinery oddly reminiscent of the background droning on board the Deathstar. Another piece of machinery, as iconic today as he was in the mid-fifties, blowing the minds of kids everywhere; Robby the Robot was a sensation, undoubtedly causing many a lunch-break argument on his authenticity, much like R2-D2 did in the late 70’s (and hoverboards in the mid–80’s). He would go on to feature in multiple movies and TV shows over the years (as would indeed the sets, uniforms and props of the entire film, such as on episodes of The Twilight Zone, one of which has two suns shining above a desert planet…), and is in many ways, to this day the icon of 1950’s science fiction. Remarkable, since the 50s were replete with robots (mostly homicidal), featured in the likes of Zombies of the Stratosphere (1952), Old Mother Riley and the Vampire (1952), Gog (1954) and Tobor the Great (1954). The latter had an eponymous robot from built by Robert Kinoshita who would go on to build Robby for Forbidden Planet. However, Robby undoubtedly had his ancestry in another now classic piece of science fiction, namely the 1951 film The Day the Earth Stood Still, in which a flying saucer lands in Washington DC, carrying the man-like alien Klaatu on his mission to warn the people of Earth about the dangers of atomic power. And along with him, his silent guardian Gort, a massive indestructible robot. The movie had been a moderate success, but more importantly was one of the first science fiction movies of its time to break out of the slum and gain some semblance of respect from the world of critics. They saw in its, at times heavy-handed, message that it was possible to do more than simple monster-romps in the genres of fantasy and sci-fi. Granted, other science fiction films, like Metropolis (1927), had been wrapped around messages, but few had been as elegant as The Day the Earth Stood Still, ending most often in heavy-handed allegory rather than powerful messages. While science fiction movies often had warnings as their central message, few were quite as classy and yet gripping as The Day the Earth Stood Still, which had been released in 1951, an idea undoubtedly picked up on by the writers of Forbidden Planet. Irving Block, Allen Adler (treatment) and Cyril Hume (screenplay) took the warning against mans self-destructive tendencies and put it into a mad scientist story set in an adaptation of Shakespeare’s The Tempest starting with the b-film treatment Fatal Planet. It was delivered to MGM on February 23rd, 1953, just in time for them to have drawn what they could from The Day the Earth Stood Still and pour it back into their own idea for a science fiction spectacular. It magnificently turns the Earth’s opening on its head. Rather than an alien landing on Earth in a flying saucer (as they were often wont to do), men from Earth instead landed on an alien planet in a not dissimilar flying saucer. They come to ensure that everything is alright, where as Klaatu came to warn us; and from Gort came Robby, poster pose and everything. Though it should be noted, that the menacing monster carry pose indeed seems like a direct lift, it was by the time of Forbidden Planet’s release in 1956 already something of a well-worn cliché, having been widely used at least since 1927. So much so that at least three films had used it in 1953 alone: Invaders From Mars, Phantom From Space, and Robot Monster. It’s a testament to the staying power of Forbidden Planet as a whole, that it is its poster that has gone on to become the go-to icon for the 1950s science fiction poster. Whatever the case, while Lucas denies itwatchtheskies, Robby was clearly one of the three primary sources of inspiration for C–3PO (Kurosawa’s The Hidden Fortress and Lang’s Metropolis are covered elsewhere). Both are sentient robots, servants wholly owned by their respective masters, with Robby upon his introduction declaring: “If you do not speak English, I am at your disposal with 187 other languages, dialects and sub-tongues,” a clear forerunner for 3PO’s six million forms of communication (which makes Robby a proto-protocol droid). Later, when Alta tries several times to summon him with her remote control, he excuses his absence with having been busy taking an oil bath. Lucas may not have noticed, but his brain did. It’s ironic in a way, that Forbidden Planet was such a tremendous influence on Star Wars, yet it was probably because of its box office failure that Lucas had trouble gaining traction with his film in the first place. After all, Aside from 2001: A Space Odyssey, there hadn’t been a successful science fiction movie in over a decade when Lucas was shopping around at the studios. Luckily time has been kind to Forbidden Planet, and it’s now considered an all-time classic. And it shouldn’t surprise anyone, given Hollywood’s preference for remakes these days, that it has been attempted remade many times over, including by James Cameron (whose first short film, Xenogenesis, owes much to Forbidden Planet). 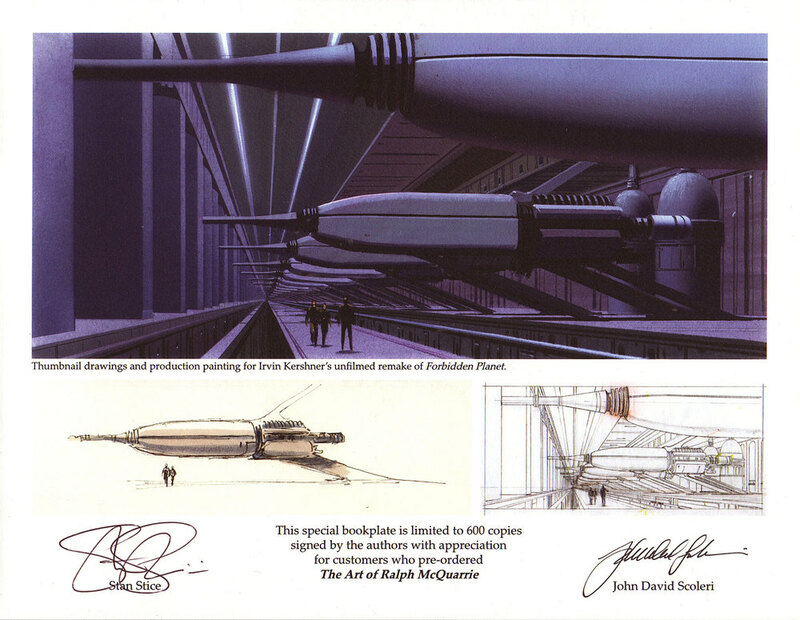 And just to bring it all back to Star Wars, one of the less well known remakes was at the hands of none other than the the late Irvin Kershner, who hired Ralph McQuarrie to work on concept art (a return home in a way, as there are also quite a few parallels between Forbidden Planet and the unproduced Star Dancing, the Hal Barwood and Matthre Robbins screenplay McQuarrie was working on when Lucas first met him). A fascinating ‘what if’, that never panned out. Unfortunately Ralph McQuarrie’s official site offers only minuscule thumbnails, and the only other piece of art I’ve seen from it, came as a print with my copy of The Art of Ralph McQuarrie. The Unauthorized Star Wars Story. Release information unknown. 1999. Jonathan W Rinzler. The Making of Star Wars: The Definitive Story Behind the Original Film. Ebury Press, 2007. Watch the Skies! : Science Fiction, the 1950s and Us (2005). Richard Shickel. Lorac Productions. 2005. Available on the Forbidden Planet DVD and Blu-Ray.